Dr. Garry FitzGerald is the leader for the Health Ministry at Saint Patrick Catholic Church. Dr. FitzGerald has a background in family medicine, preventive medicine and public health. He has been a parishioner at Saint Patrick Catholic Church for over 20 years with his wife Cathleen, a former professor of Public Health Nutrition. For the past 20 years Dr. FitzGerald has commuted to Loma Linda University Medical Center in California where he has served as the Vice President for 800 Faculty Medical Group physicians. He also served on the Committee for Christian BioEthics and as an Associate Professor in the School of Public Health. Dr. FitzGerald’s goal is to ensure that Saint Patrick Catholic Church is a parish where faith and wellness go hand in hand; to assist each parishioner in becoming the whole person Christ intended them to be. The Health Ministry is a pastoral care ministry that will work to meet the health needs of our faith community. Dr. FitzGerald is developing a vision and action plan for the ministry. The Health Ministry is transitioning Saint Patrick Catholic Church in to a “Blue Zone Parish” this year. A Blue Zone Parish is a parish where faith and wellness go hand in hand to assist each parishioner in becoming the whole person Christ intended them to be. 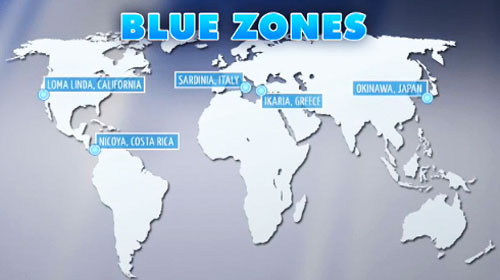 What exactly is a Blue Zone? In 2005, National Geographic identified five places in the world where people live longer and healthier, without medications and disabilities. These places became known as Blue Zones, and researchers have found that these people live a lifestyle that includes a healthful diet with daily exercise, and they place an emphasis on family, purpose and religion. It was also found that churchgoers lived longer than non-churchgoers. Check out the full article on Blue Zones as it appeared in National Geographic. During Lent 2016 Saint Patrick Catholic Church kicked off a “Meatless Fridays During Lent” campaign— as a way to combine the spiritual and physical benefits of good nutrition. The Health Ministry provided weekly Meatless Friday recipes during Lent and encouraged families to go meatless on Fridays during Lent. 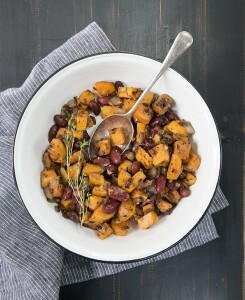 The recipe for the first week of Lent is Red Bean and Sweet Potato Hash. Red beans and sweet potatoes is an irresistible combo of fun flavor and serious nutrient goodness—and a great way to use up a leftover sweet potato if you have one hanging out in your fridge. You can also substitute any other kind of potato (raw or baked) to use up what’s already in your kitchen—or what your potato-loving taste buds might prefer. 1. Heat the oil in a large skillet over medium-high heat. Add the onion and cook until softened, about 5 minutes. Add the garlic and cook for 1 minute longer, then stir in the sweet potato, thyme, oregano, and salt and pepper to taste. 2. Place the beans in a bowl and mash them with a fork or potato ricer. Add the mashed beans to the skillet and stir to combine with the onion mixture. Cook, turning frequently, then pressing the spatula down on the mixture, until the bottom is lightly crisped and browned when turned, about 10 minutes. Serve hot. For this recipe, the sweet potato should be tender but still firm enough to dice. Preheat the oven to 400°F. Pierce the sweet potatoes with a fork in three places. Wrap each sweet potato in foil and bake for 45 minutes to 1 hour (depending on the size of the potatoes) or until tender. If you don’t have a cooked sweet potato (or the 45 minutes to an hour it takes to bake one), you can microwave one in minutes: Pierce the sweet potato with a fork in three places. Place the potato on a microwaveable plate and microwave on high for 5 minutes, rotating halfway through. You may need to microwave it a minute or two longer, depending on the size of the potato, until it is tender. The recipe for the second week of Lent is White Bean Posole Verde. Roasted tomatillos, jalapeños, and poblano peppers create a rich base with a beautiful green hue, while white beans add buttery texture and added protein and fiber. 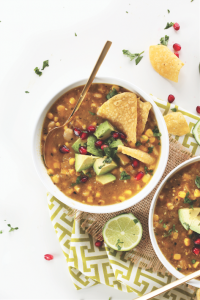 Serve this spicy soup with tortilla chips, fresh lime juice, and ripe avocado for added creaminess. Heat oven to high broil and position rack at top of oven. Remove charred peppers and tomatillos from oven and wrap peppers in foil to steam. Wait 3 minutes, then remove skin, core, and seeds from poblano and jalapeños and any stems from the tomatillos. Add to a blender with garlic and onion. Blend/purée until semi-fine consistency is achieved. A little chunkiness is OK and even good (depending on texture preference). Add mixture back to pot over medium heat. Add vegetable broth, beans, and corn or hominy and stir. Bring to a simmer, then cover, reduce heat to low and continuing simmering until beans have absorbed flavor of the broth—at least 15 minutes. The longer it cooks, the more flavorful it will become. Sample and adjust seasonings as needed. Serve as is, or with desired toppings. Store leftovers in the refrigerator for 4-5 days, or freezer up to 1 month. Reprinted from Minimalist Baker’s Everyday Cooking by arrangement with Avery, a member of Penguin Group (USA) LLC, A Penguin Random House Company. Copyright © 2016, Dana Shultz. 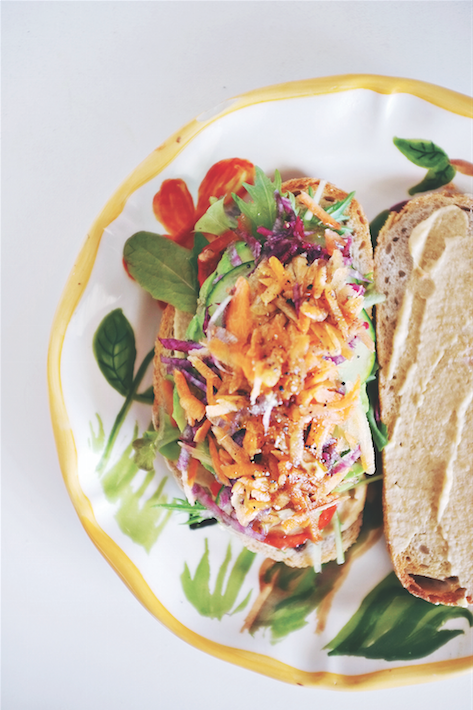 Turn your salad into a sandwich you can take to work or pack up for a family picnic. Get creative and pile up seasonal vegetables or switch up the hummus for a white bean spread to make this vegetarian sandwich a favorite for everyone in your family. Shredded beets and carrots are always a great addition to a salad. Actually, anything and everything inside this sandwich can and should be used in your dinner salad—even the hummus works well in a dressing! Recipe from The Plantiful Table: Easy, From-the-Earth Recipes for the Whole Family, copyright © Andrea Duclos, 2015. The cornerstone of every Blue Zones diet in the world? Beans. There are at least 70 varieties of beans to choose from and an infinite number of ways to prepare them. Here’s one delicious, recipe to spark your bean-spiration. 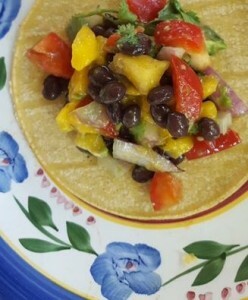 In a medium bowl stir together diced mango, red onion, red pepper, lime juice, chopped cilantro, avocado, black beans. Add a few generous pinches of salt. Taste and adjust seasonings. This Sardinian Pasta Fagioli packs a punch with a hearty serving of beans. The Sardinian diet is based on a foundation of olive oil, whole-grain bread, beans and wine. The beans provide Sardinians with a lot of fiber, protein, and complex carbohydrates that give them energy throughout the day. Wash and soak beans for 2 hours. Rinse beans and bring to a boil with lid on pot. Don’t let it boil over. Use 1/2 gallon, or more, water. Cook until semi tender. Add all other ingredients except pasta, including vegetable broth, and cook over medium to high heat, stirring occasionally to avoid burning. Continue to cook until the beans are tender (about 2-3 hours). Add broth as needed. Cook pasta separately in boiling salt water until al dente. Rinse, drain, and cool. Mix the pasta and beans, add a sprinkle of pecorino cheese (optional), and serve. Also called spanakopita in Greece, where it is commonly found all across the islands, Greek spinach pie is a savory dish that can be made traditionally with spinach or can be substituted with other greens such as chard or dandelion greens. The “Blue Zones” centenarians eat lots of leafy greens on a daily basis, so mix it up and get your greens without having to eat a salad. In a separate bowl, whisk together oil and water until creamy. Add flour and stir with a fork to combine. Swipe your counter with a wet washcloth and place a 12-inch square of waxed paper on top. Place the ball of dough on top and cover with a second 12-inch piece of waxed paper. Cover with top crust. Slash for slits. The Health Ministry leader’s strong connection to Loma Linda University Health (LLUH) brings 2-minute videos that reveal the secrets of living a long and healthy life to the faith-community at Saint Patrick Catholic Church. According to the Pew Research Center, health information is the most searched topic on the web. With nearly 75 percent of internet users searching the web for health inquiries, it’s becoming a go-to source for health information. The first in the series of videos presented to the faith community at Saint Patrick Catholic Church was Standing! Did you know that the average American spends 13 hours a day doing this. Some researchers call it the “new smoking.” In fact, you’re probably doing it right now— sitting. But getting up and moving periodically throughout the day is key to protecting you from developing chronic diseases. Watch the video to learn more. The health series unveiling simple ways to live healthier, longer comes from the place where people live the longest. Check out the online video health series, Live It, featuring 2-3 minute long videos which unveil the secrets of living a long and healthy life. Highlighting Loma Linda University Health (LLUH) research, each episode features simple tips to live healthier, longer.